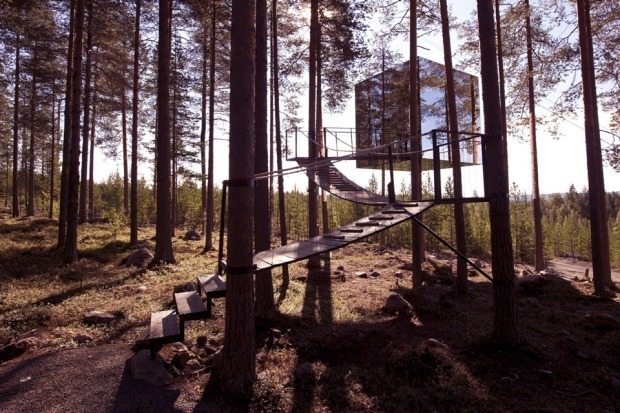 The Mirror Cube at the Treehotel. The interior of the Mirror Cube. It started with a fishing trip. Kent Jonsson Lindvall, a Swede whose interest in adventure travel had led him to lead fishing trips across Europe, was taking a group on a fly-fishing tour of Russia. 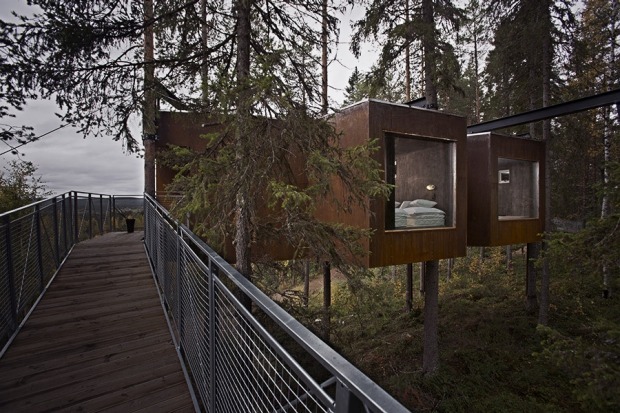 On this occasion, that group just happened to include three of Sweden's leading architects. 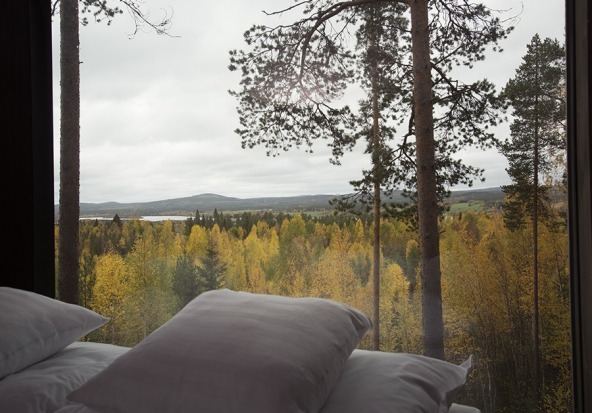 Kent, with his wife Britta, also ran a small bed and breakfast in Harads, a tiny town about an hour outside the city of Lulea in northern Sweden. 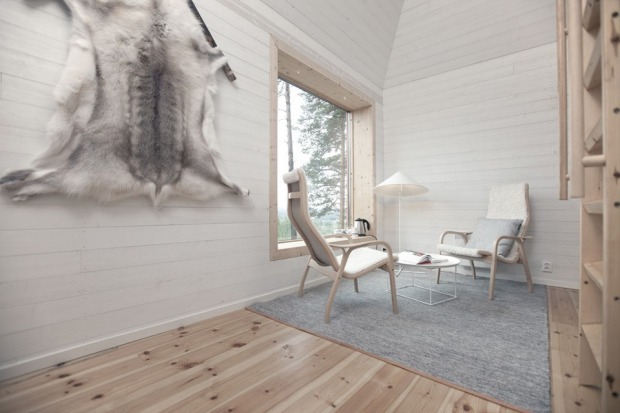 Though it had built a reputation for cosy accommodations and quality food, Britta's Pensionat, as it's called, is a simple place. 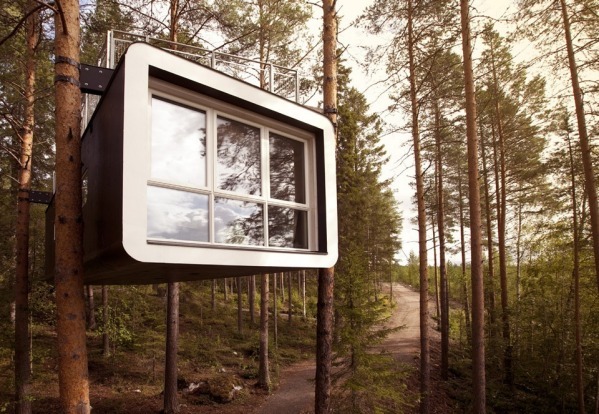 A small guesthouse with nine rooms, sitting alone on the side of a major road. Inside, mismatched antique furniture, china tea sets and floral fabrics give the place a sense of quaint, old-fashioned charm. It's a world away from what you'd call cutting-edge design. But beyond the main building, things are different. 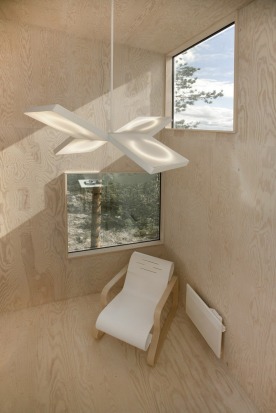 During that fishing trip with the architects, conversation naturally turned to design. It was then Kent had an idea. 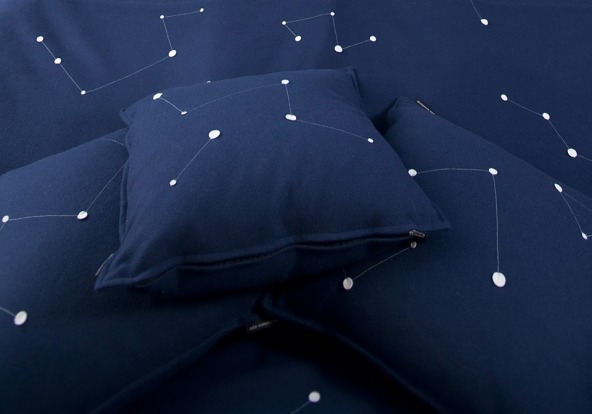 Could these ground-breaking designers come up with some rooms for him? 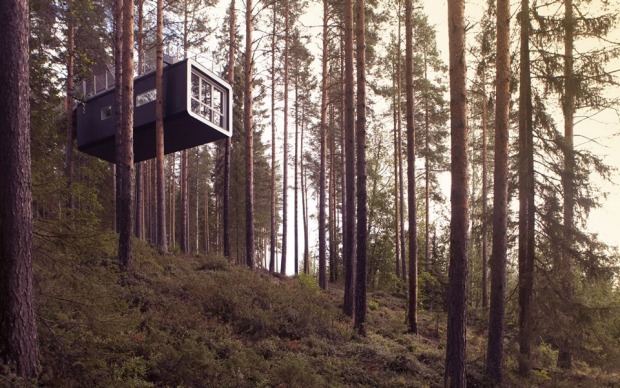 The property behind the B&B extended up a hill and into forest. Though Kent and Britta owned it, it was essentially wasted space. 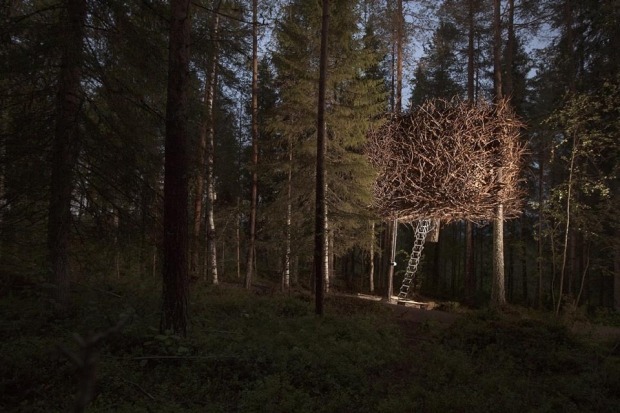 Part of the land had already been used to build a treehouse, for use in the Swedish documentary The Tree Lover, but the structure was too remote to be used by guests. 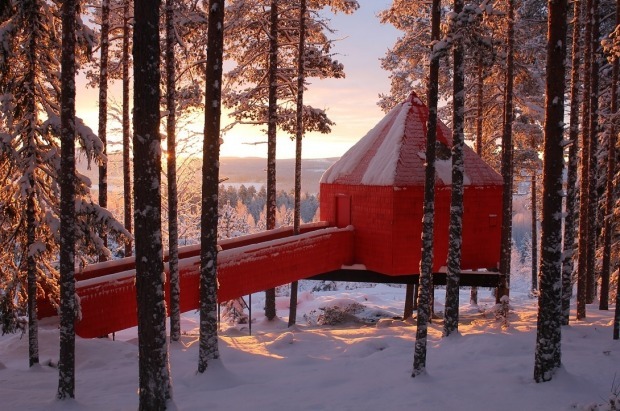 It was this first treehouse that inspired the architects to come up their own versions – striking designs that could be used as hotel rooms by guests. 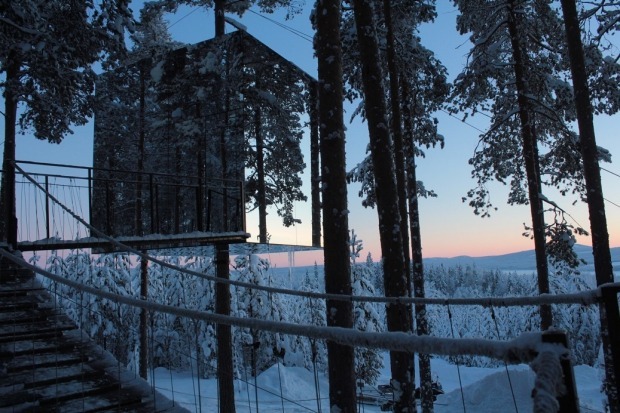 The Treehotel opened in 2010 and now offers six treehouses, each its own unique design, inside and out. My own stay is in the Blue Cone, which is actually red (and Kent won't be drawn on why this is so). 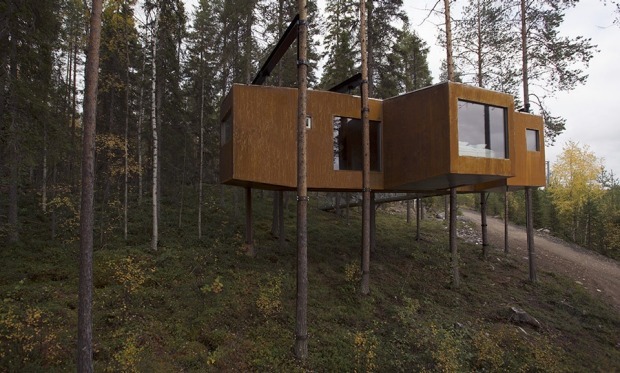 The small structure looks like a child's drawing of Santa's holiday house. 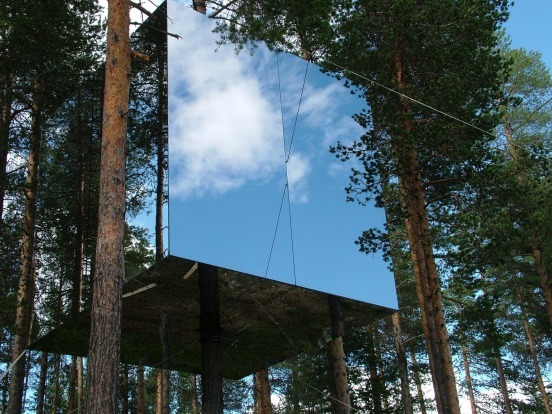 Nearby is the Mirror Cube, which is, exactly as the name suggests, a perfect cube in the trees with mirrored surfaces. The visual effect is such that when you first see it, you're not quite sure what you're looking at. 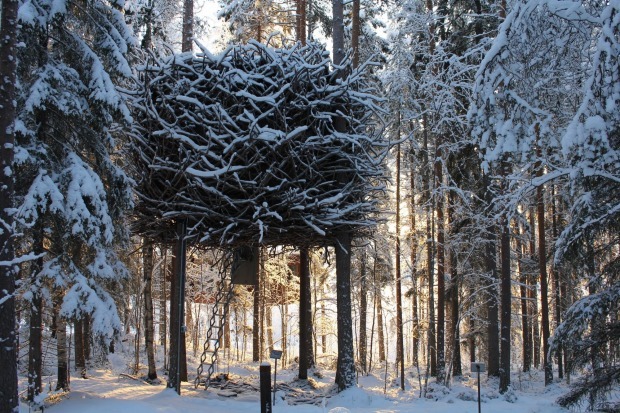 The same goes for the Bird's Nest, a structure covered in jagged branches that looks like the home of some giant raptor. 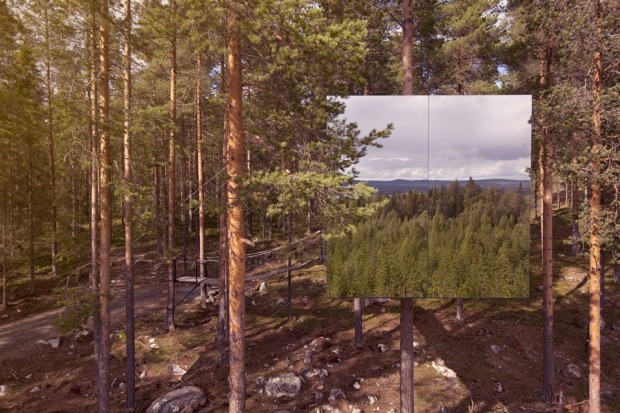 In the dense forest, it's easy to miss at first glance. 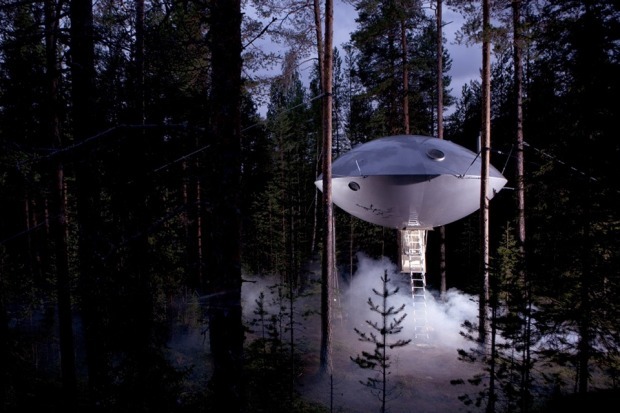 More obvious is the UFO, a classic sci-fi design that looks like it just landed on earth after arriving from a distant planet. 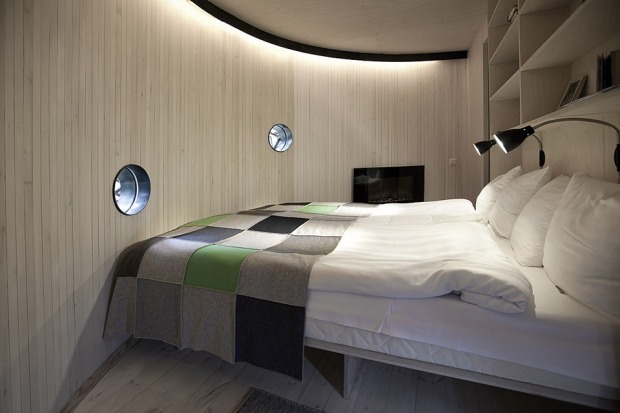 Entry is via a retractable ladder that descends from the bottom of the room, its glowing light making you feel like you're ascending to depart like Richard Dreyfus at the end of Close Encounters of the Third Kind. 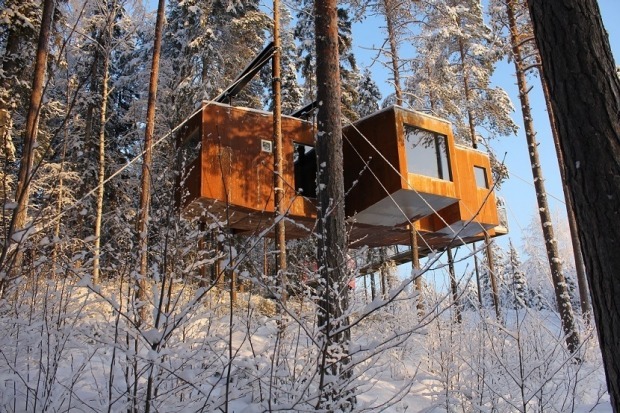 The Cabin and the Dragonfly feature similar designs, both suspended in the trees. 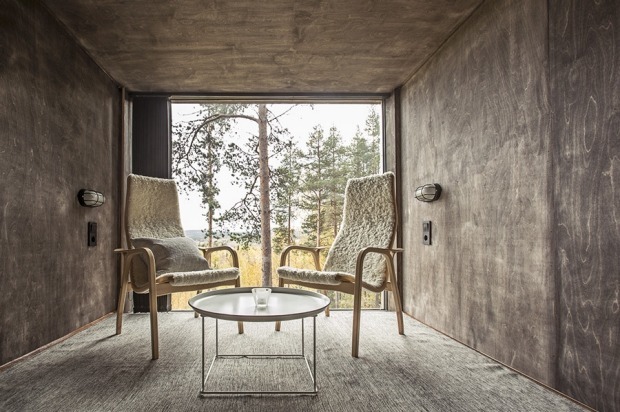 The former offers two guests a rooftop deck for an even higher view of the landscape, while the latter is the largest of the rooms, able to accommodate four guests as well as doubling as a conference facility with seating for 10. 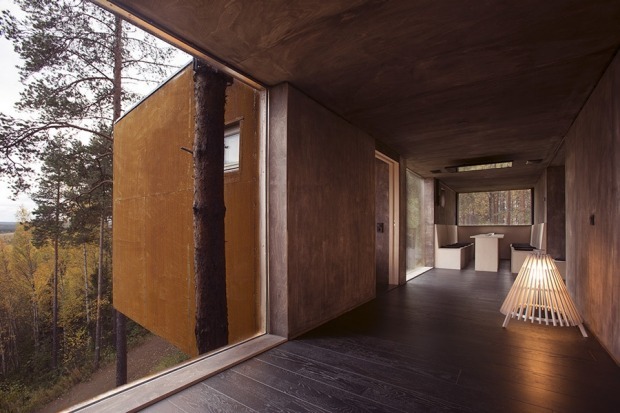 Each one is equally striking, with some blending in with the landscape while others are brightly contrasting with the forest surrounds. 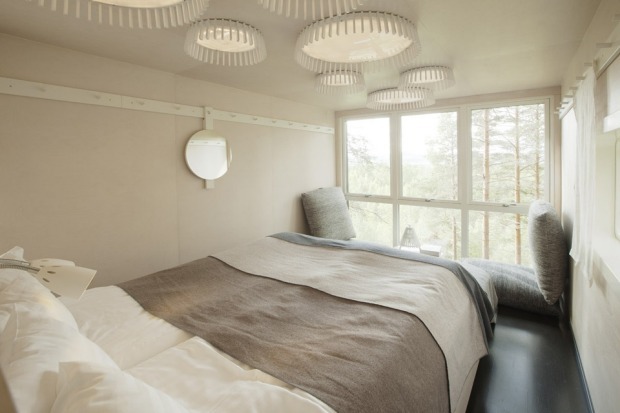 Guests staying multiple nights will often change rooms to experience more than one. Our Blue Cone is a short walk from the main house along a snow-covered track, marked with small posts. The snow dusts the forest firs – we are truly walking in a winter wonderland. 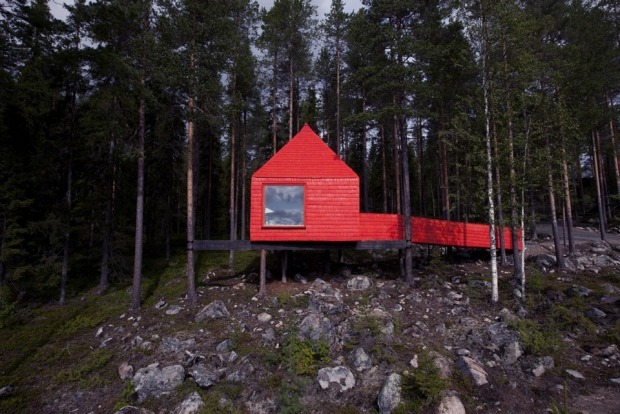 The room is not high in the trees and can be accessed easily from the short, bright red ramp that leads to the door. 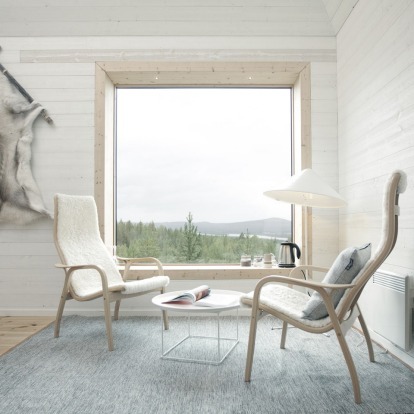 Inside, it's a classic example of Swedish design – making intelligent use of every space. 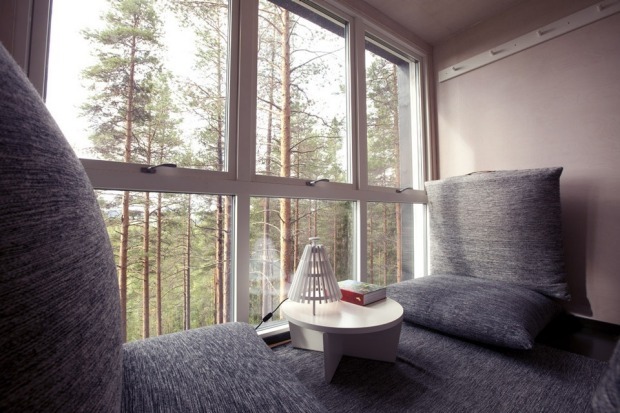 The queen-size bed sits in an alcove, with two chairs sitting at the large window that frames the outside landscape like a painting. We've been in the room several minutes before I realise there's a ladder leading to a loft space where there's two single beds. 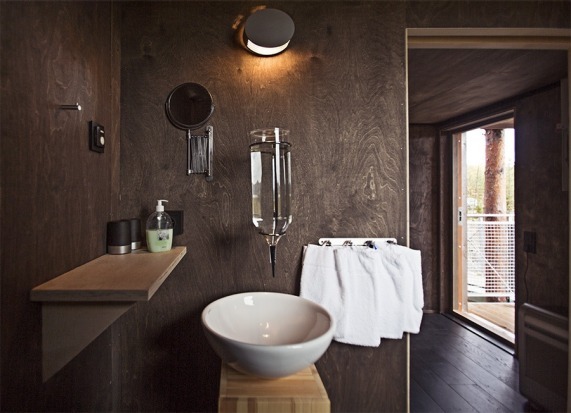 There's no plumbing here in the trees – instead, we have an inverted water bottle above the bathroom sink, but showers need to be taken down at the main house. The lack of plumbing does not prevent us from having a toilet though, but rather than the sort of smelly drop toilet you might find in the Australian bush, ours has a built in incinerator, which also helps heat the room. 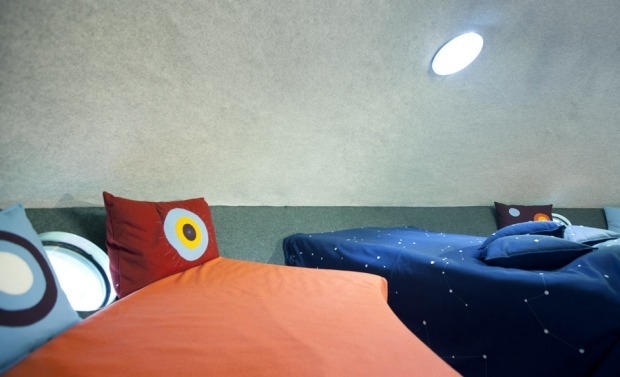 Although the interiors are basic, there's a surprisingly strong Wi-Fi signal – better than I've experienced in many city hotels. So it's an opportunity to start Instagramming straight away. Meals are served at Britta's restaurant in the main building and it's hearty, warming home cooking. For lunch it's sausage, bacon and potato stew with vegetables, while for dinner we try out the local fish – Arctic char. While Britta looks after the cooking, Kent takes guests on outdoor activities. In the early afternoon we take snowmobiles down a trail and onto a frozen lake, where Kent demonstrates how to fish with a line in the ice, before we head back to land to enjoy a sundowner around an open fire (it's winter, so this sundowner is happening at about 3pm). Kent tells us of his plans for another hotel, this one floating on the nearby lake. 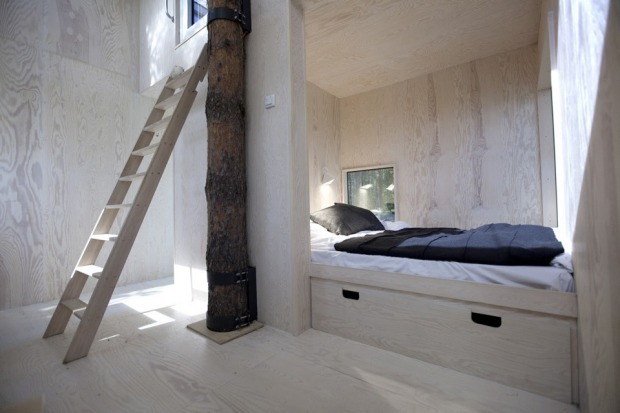 He already has designs drawn up and this idea looks just as imaginative and striking as the last. 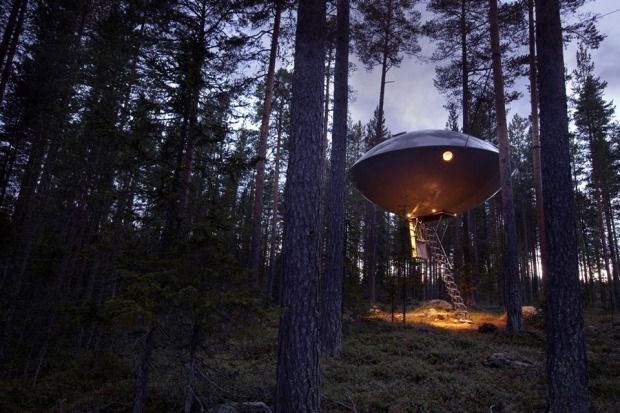 In the meantime, the Treehotel continues to draw attention from across the world. 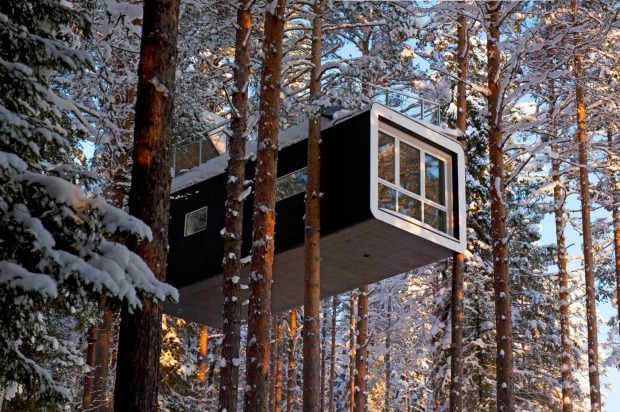 Even New York's barometer of all things cool and fashionable, Vogue magazine, has given the Treehotel the ultimate compliment – the world-famous publication did a fashion shoot at the hotel, making the place world famous in the process. Lulea itself, a town where the main industry is farming and processing reindeer meat, had already made world news in 2011 after becoming the home for Facebook's European data centre – the company's first outside the US. 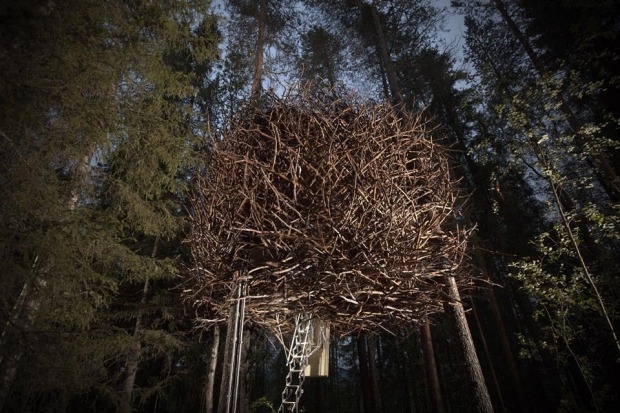 I've little doubt that the servers in the centre have seen hundreds, if not thousands, of photos of the Treehotel pass through them on their way to people's Facebook pages from around the world. It's a special place, and certainly hard not to "Like". Etihad flies from Melbourne, Sydney, Brisbane and Perth to Abu Dhabi with connections to Berlin through Air Berlin. From there, several airlines fly to Sweden. The nearest airport to Harads is Lulea, about one hour's drive. Craig Platt travelled as a guest of Off the Map Travel, Etihad and Air Berlin.